Another month just went by and that means it's re-cap time! I'm pretty excited for the projects I crossed off my list in August! 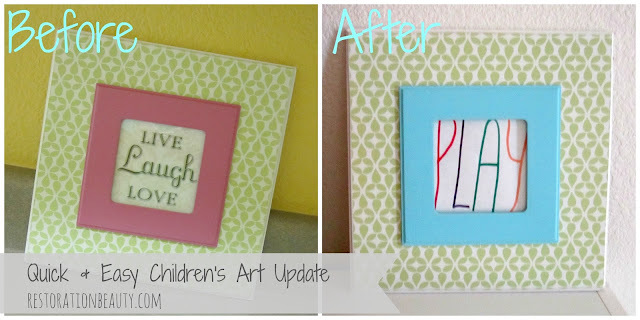 I almost failed this Bookshelf Makeover! Thank God I saved it with some pretty chevron striped paper! I finally got around to Painting My Bathroom Cabinets! It only took me 4 years! This one is my absolute favorite! 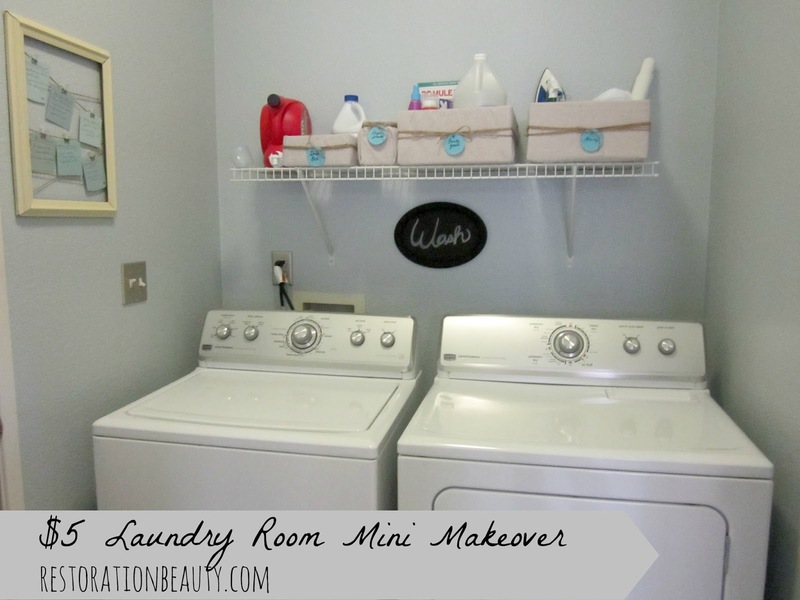 I gave my Laundry Room a little makeover for only $5!! 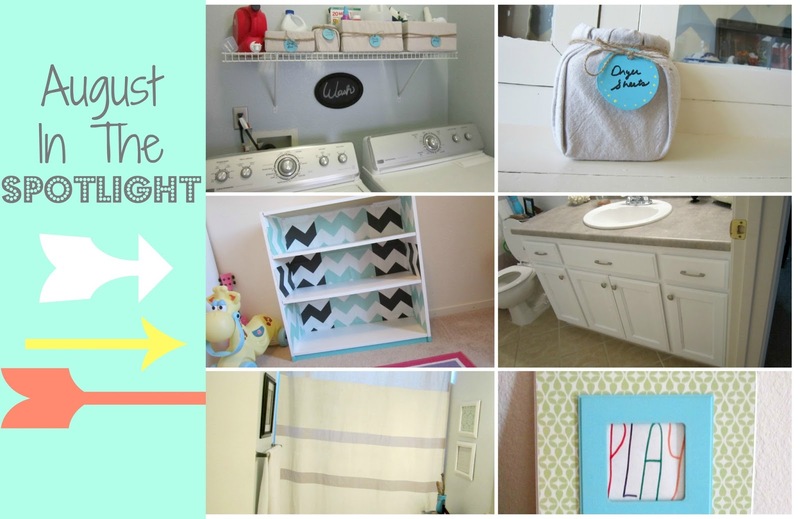 I also shared some of my favorites from our Summer Spruce-Up Wildcard Party and guest blogged over at Rain On A Tin Roof on Thrifty DIY Projects & Makeovers! It was definitely a busy and productive month! What did you check off your list in August? I'd love to hear about it! By being resourceful and putting to use things I already had on hand, I was able to give my once drab laundry room a pretty impressive pick-me-up for only $5. Yes, you read that right. $5!! 2. Addressed the cluttered shelf with by organizing everything with some DIY storage boxes. Okay, now on to the fun (and pretty) part! The first thing I addressed was the disheveled mess I had on the shelf! I made some storage boxes with boxes I had laying around and some drop cloth. I also had an old glass container that I was going to throw away but rescued! 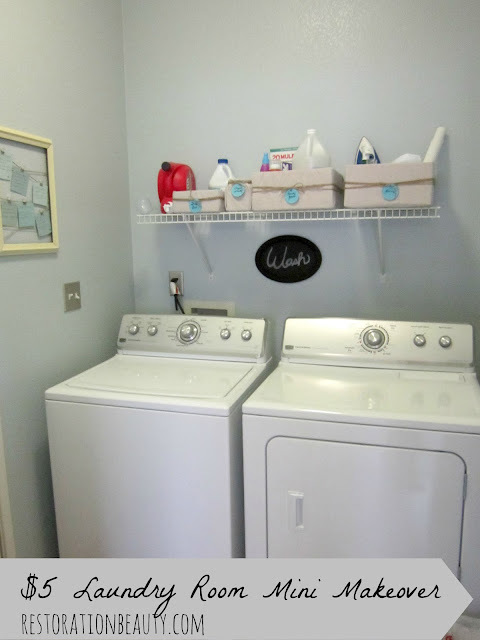 It now holds used dryer sheets that I use to collect all the lint that accumulates on my dryer (A tip I read on Pinterest!) 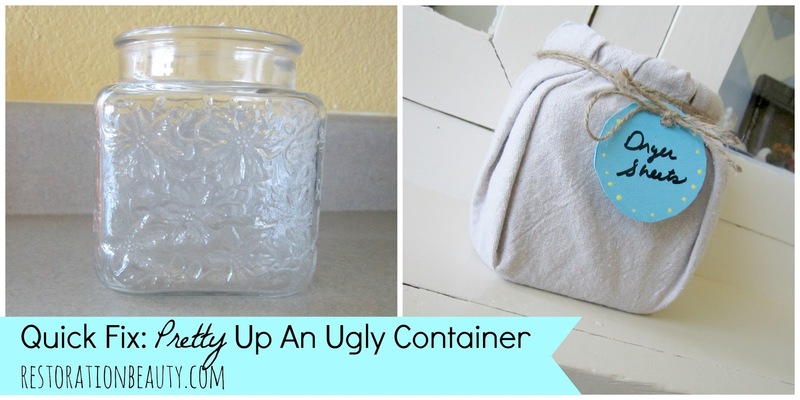 You can read more about how I gave my glass container a simple makeover here. I also incorporated my DIY labels and finished it all off by wrapping the boxes with some twine. I now get to look at this tidy laundry shelf that has a place for everything! I made this twine memo board and used paint chips to write down all my DIY cleaning recipes! Now I don't have to keep looking them back up online when I run out! 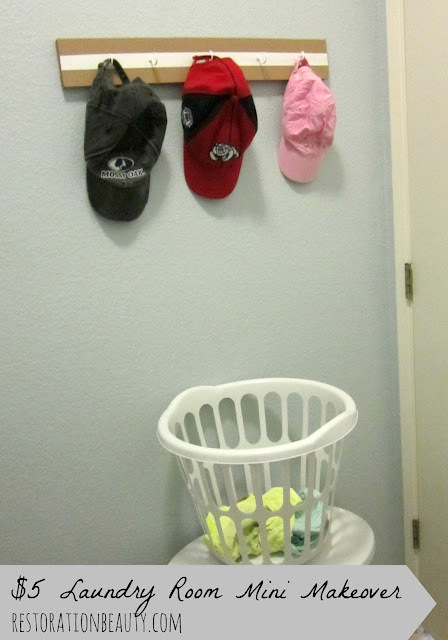 I had some leftover wood from my Gallery Wall Ledges and put it to work by making this hat hanger! Tutorial coming soon! I also spray painted the light switch covers (and screws) in Krylon's Satin Nickel. That stuff dries so fast that I was able to hang them back up the same day! I love the way they look against the grayish blue wall, don't you? 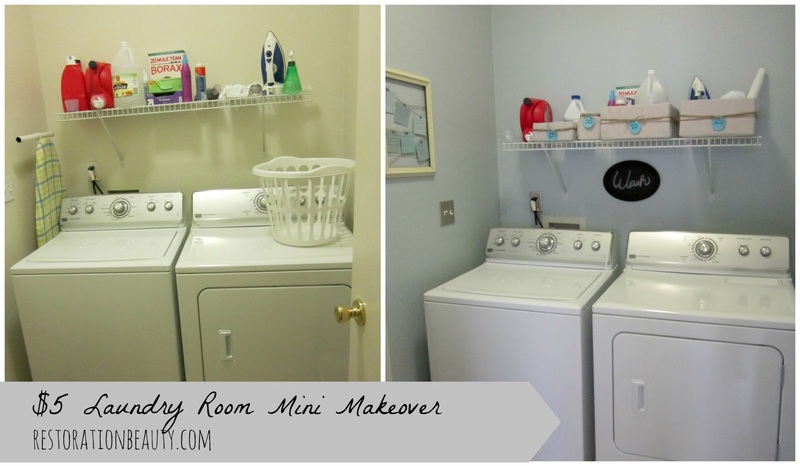 Our laundry room is teeny tiny, so I'm all about using every nook and cranny to our advantage. This mop and broom organizer enables us to use space that would otherwise be useless! Not to mention, it keeps things off the floor! So what did I spend the $5 on??? The cup hooks I used for my hat holder! Otherwise this makeover would have been free! What do you think? 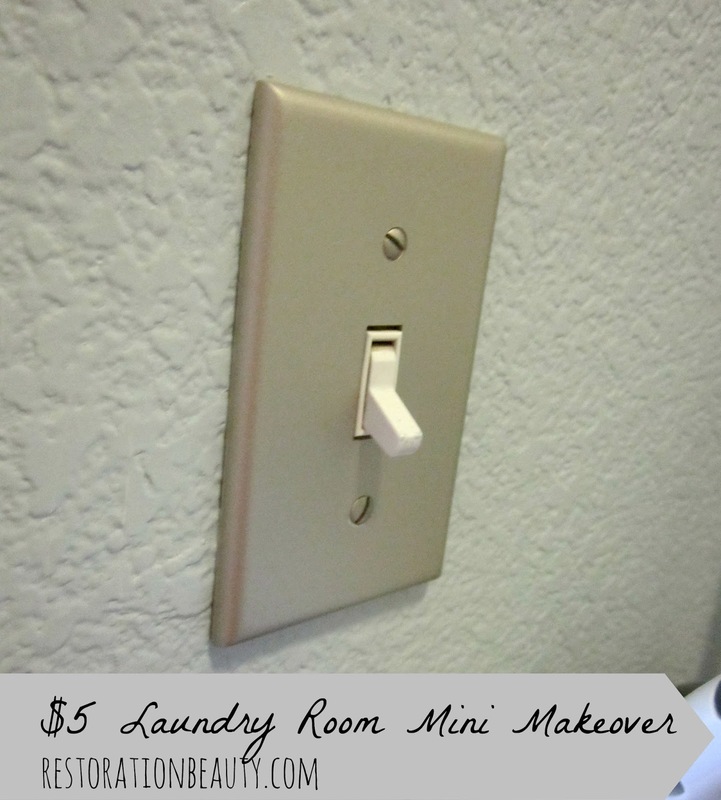 Do you like being resourceful when giving a room a little pick me up? Why miss a post? Follow Restoration Beauty via one of the following and always be updated! 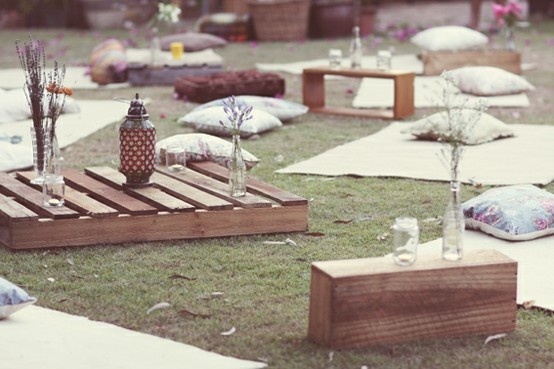 Man, did we have some good times during our Summer Spruce Up Series! 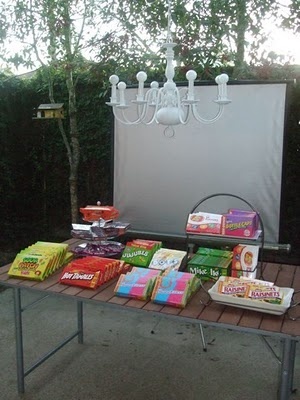 We just finished our last party (Wildcard theme) last week and I rounded up some of my favorites to share with everyone! There were some very cool ideas! I'm not a gardener. 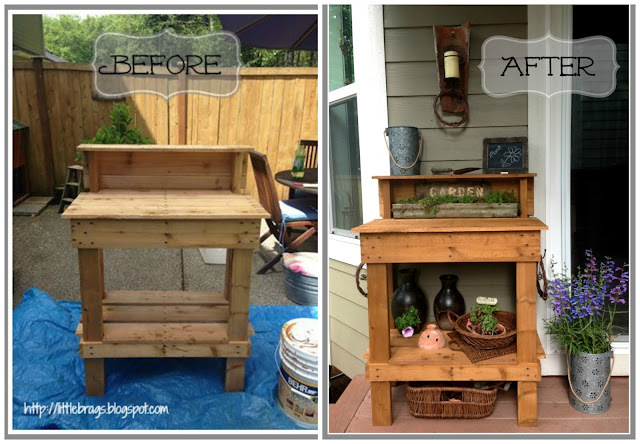 But if I were I would need this rustic looking potting bench! A HUGE thanks to everyone who hanged out with us during our Summer Spruce-Up Series!! It was fun! I hope everyone has a lovely Monday! 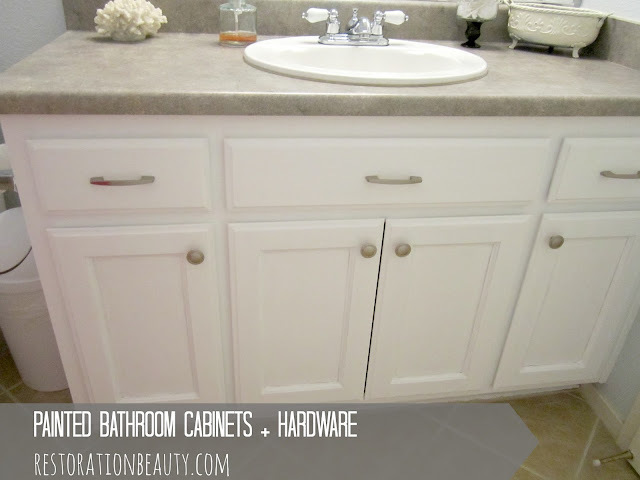 What's sadder than worn cabinets with no hardware? The fact that it took us 4 years to change these babies! But boy are we glad we finally did! And in this case, it was better late than never! 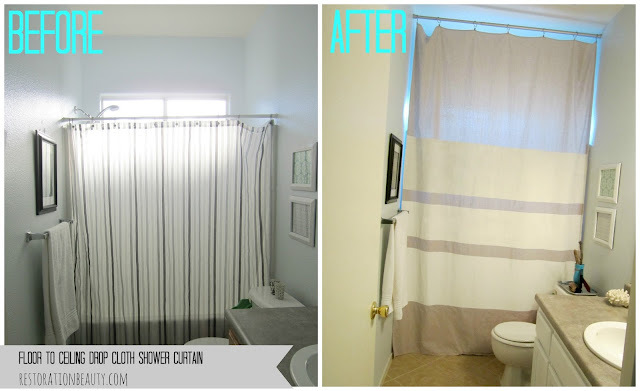 I decided to go with the classic white since our walls are a light blue and everything in the bathroom promotes a calm, airy and fresh effect. 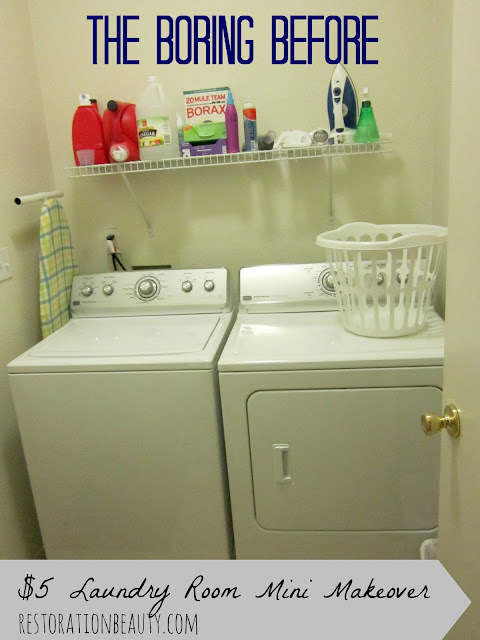 It's also a small bathroom, so keeping things light makes it feel bigger (at least to me). Here are some pictures of the progress. You can see from the last picture where the cabinets are all painted but are still sans hardware, what a huge difference adding hardware makes! 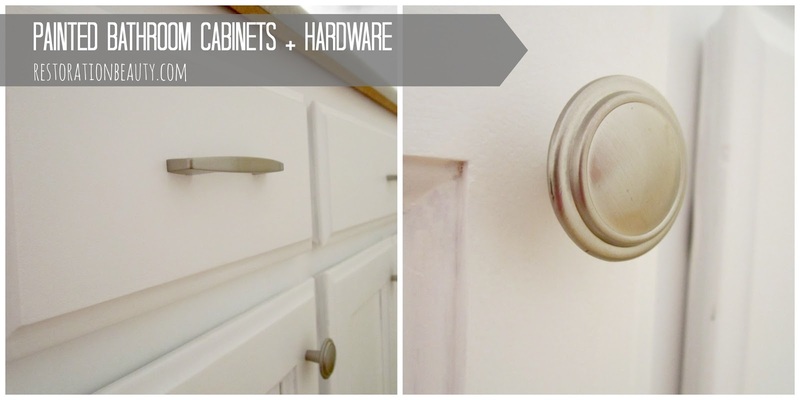 Here's a close up of the hardware I purchased from Home Depot at a very budget friendly price! This is the second time I've painted cabinets but this time was much easier compared to when I did our kitchen since there were a lot less cabinets to paint. 1. Clean base and cabinets thoroughly with warm water and soap. Allow to dry completely. 2. Lightly sand base and cabinets. I used 120 grit sandpaper. Vacuum all your dust particles and wipe off again. 4. Allow to dry between coats. I applied 3 coats and had great coverage. For reference I used Behr's Ultra White in Satin (I'm just not a fan of semi-gloss or gloss). I used the same finish for my kitchen cabinets and have not had any problems wiping off any grime. And that's with a hubby who is a messy cook! 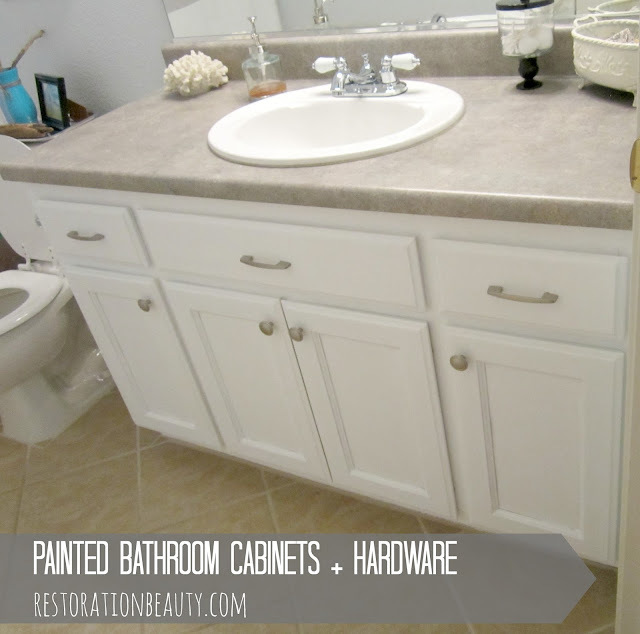 What is your favorite color for bathroom cabinets? Do you have any tips for getting the job done? WOW! This summer is going, going...almost GONE!!! 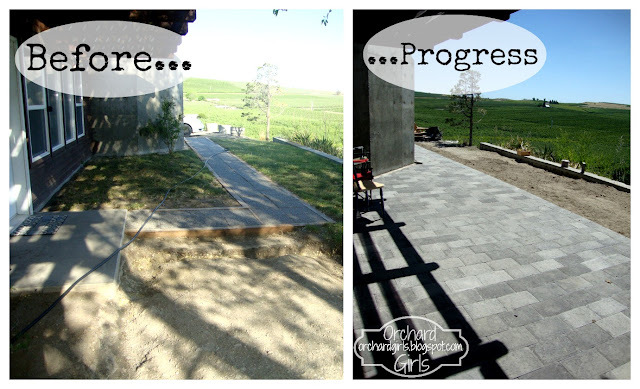 Check out some backyard/patio links here. 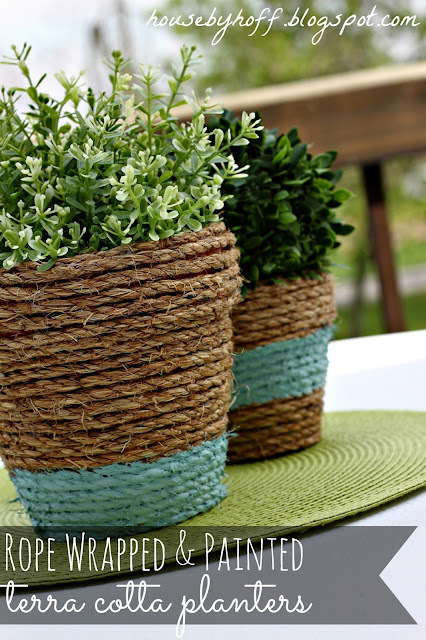 Get inspired with some great planter ideas here. 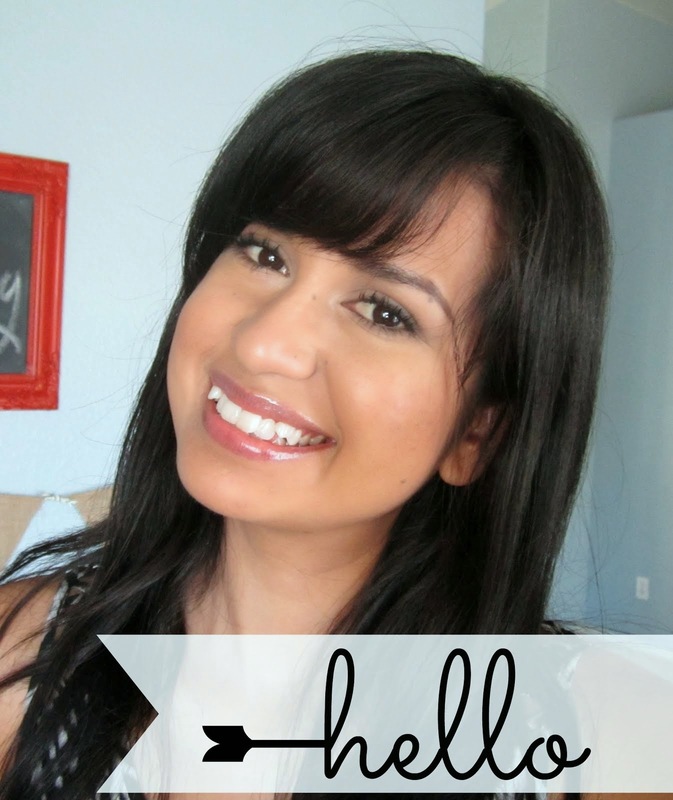 Greet your guests with a cute and spruced up entryway...click here for ideas! 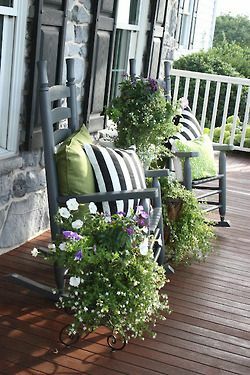 We have time to squeeze in one last Summer Spruce Up project...let's see what you all did! Remember...it is a WILDCARD entry!! 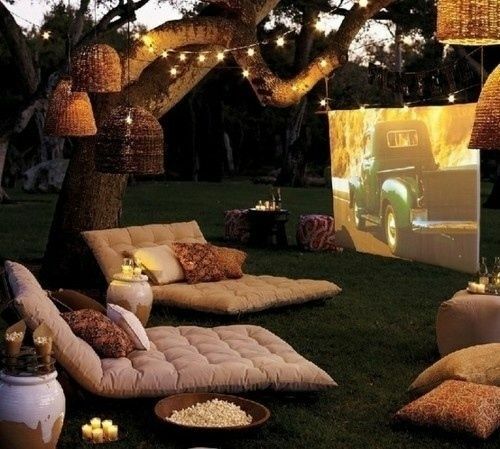 That means anything outdoors goes! Wow! 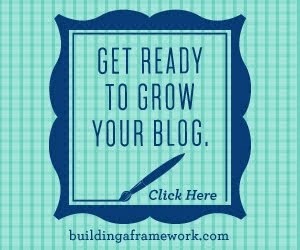 This is my 100th post! Who knew I had so much to say? I guess my hubby would know. I'm always babbling away my ideas to him! 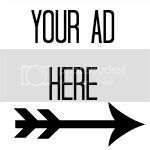 I sure appreciate everyone who takes the time to read about my projects and ideas! Thank you all so much! Before I start sounding like someone who just won an Oscar, I'd like to show you how this ugly glass container (with no lid) got saved from the trash in an instant! Literally. I was just about to throw this glass container away, whose lid I'd broken some time back, when I happened to have a light-bulb moment! Cover the poor thing up with good ol' drop-cloth (you all know how much I love this stuff) and call it a day! 1. 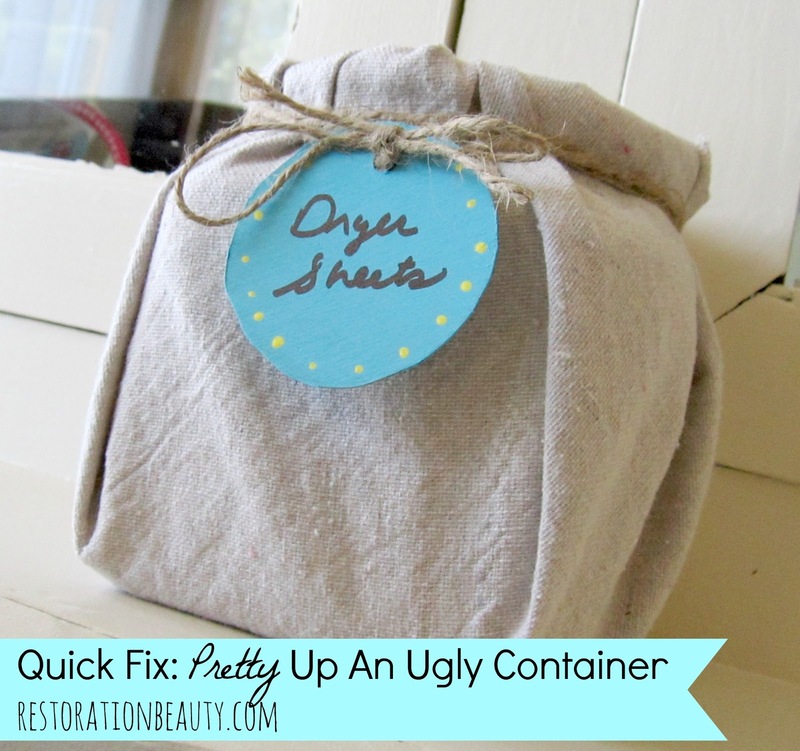 Lay your container on a piece of drop cloth (or any fabric) enough to cover it. 2. 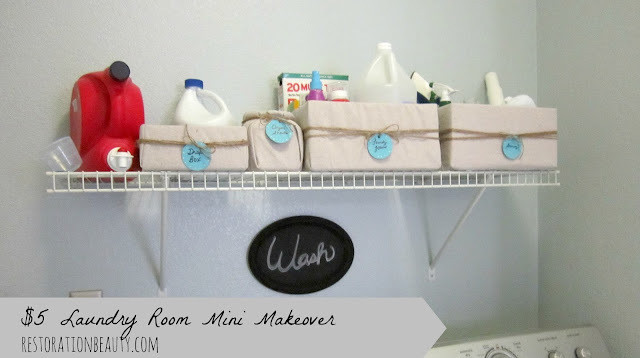 Wrap your container by lifting the drop cloth upward. 3. 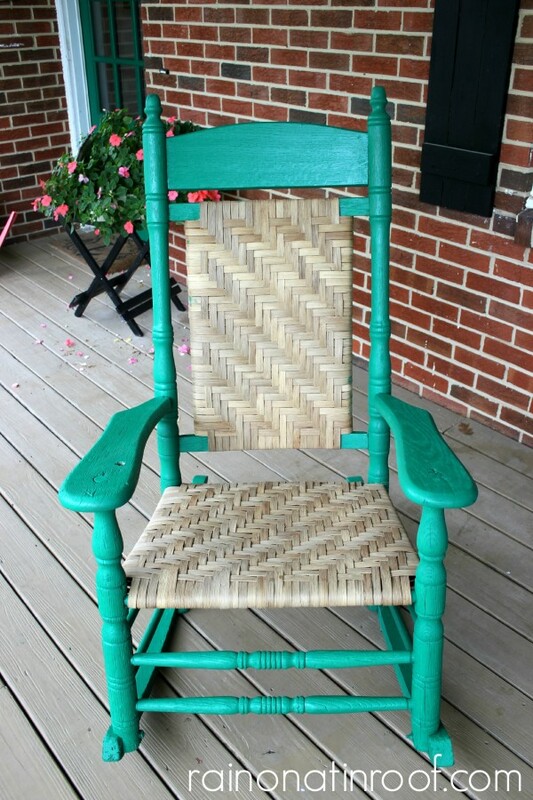 Tie a piece of twine (rope or ribbon would also be cute) around it. 4. Glue your loose ends inside of the container! Easy and fast enough, huh? I actually went a step further and added a pretty label to it! You can check out how I made this label here. Isn't it the cutest little thing you've seen? It sure is the cutest little thing in my laundry room, which I will show you all very soon! 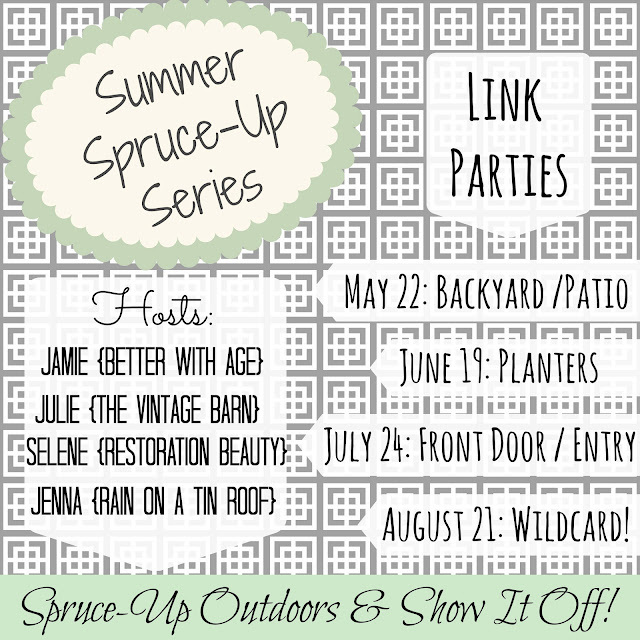 Let's get WILD with this last of our Summer Spruce Up Series Link Party! It has been one FABULOUS series full of wonderful ideas and great spaces! 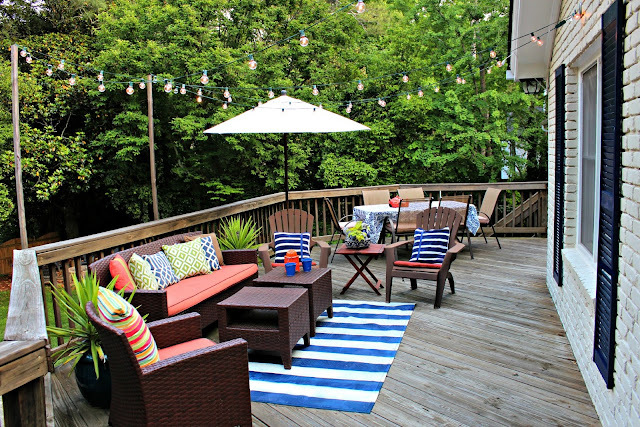 In May, you showed off your fabulous backyard and patio areas! In June, you wowed us with your planters..wow! 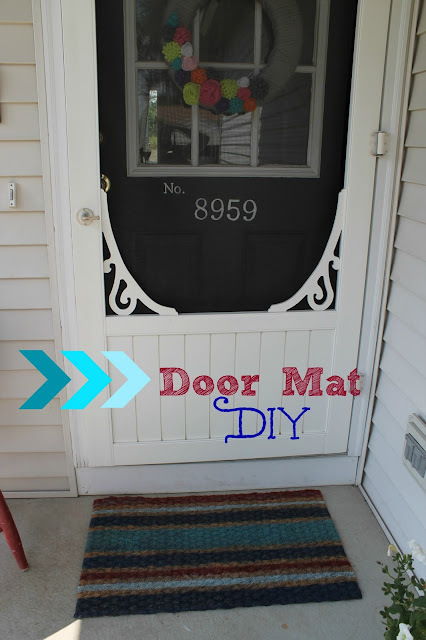 In July, we were amazed by your front door and entryways! Now, for August...it is our WILDCARD PARTY!! including an outdoor kitchen to enjoy the last few weeks of SUMMER!!! 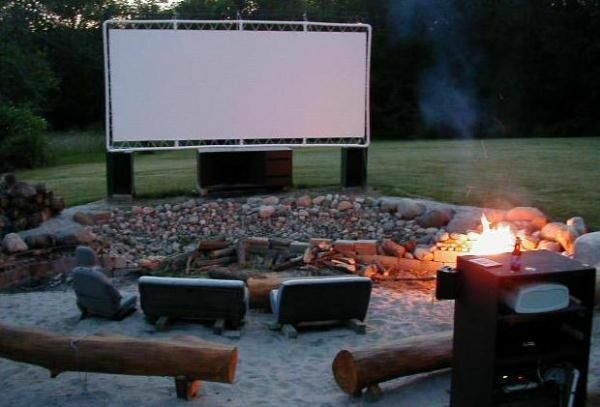 Or....how about a backyard movie theater for an end of summer blowout?!?! I'm off to go plan my little wildcard project and I can't wait to see yours next Wednesday! One of the many things I delight myself in is organizing. I can't get enough of it! Especially when it comes to the kitchen. When I'm not organizing (and re-organizing) my own kitchen, I'm stalking Pinterest and other blogs to see how others are getting the job done. 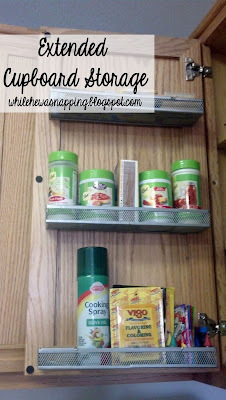 I have found so many clever kitchen organization ideas and thought I'd share some of my favorite with you today! 1.) Got wall space? Then you have organization space! Put it to use by adding a magnetic strip and have all your knives hang out right there ready to be used! 2.) There's hidden space that goes unused behind your cabinet doors! 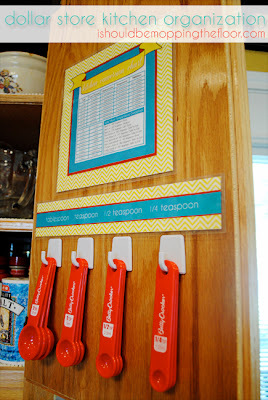 Why not add some hooks and hang your measuring spoons? 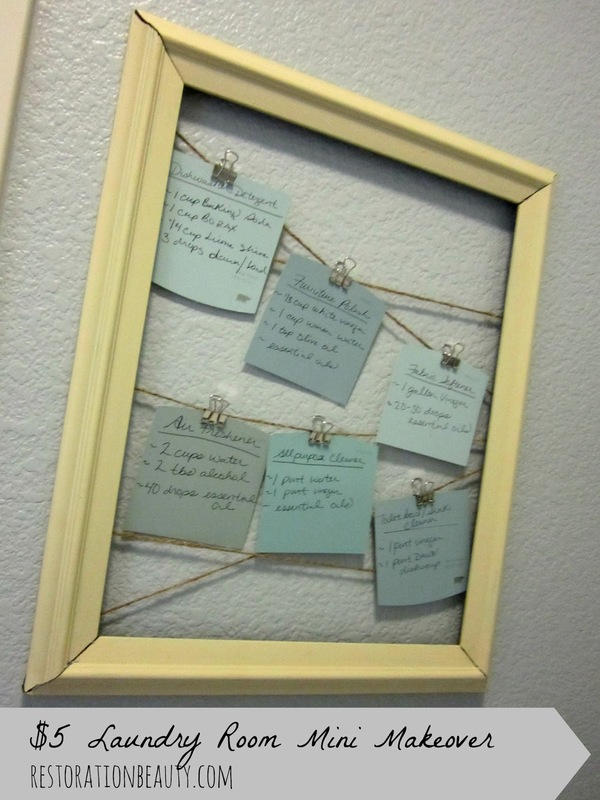 You can also tape your menu and grocery list to these babies and have all it all hidden! 3.) I don't think I've ever personally met anyone who has their pots, pans and baking dishes well organized...ever. But it can be done with racks! There is hope! 4.) I love how this pantry has pull out drawers instead of shelves! It makes finding everything so much easier. And those chalk labels will have you munching on your favorite snack in no time! 5.) Another great way to put the inside of your cabinet doors to use it to mount some small containers! 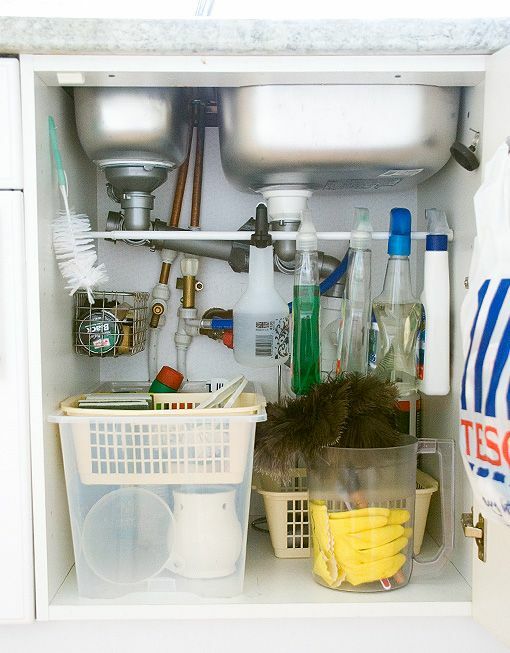 Instant cupboard space! 6.) 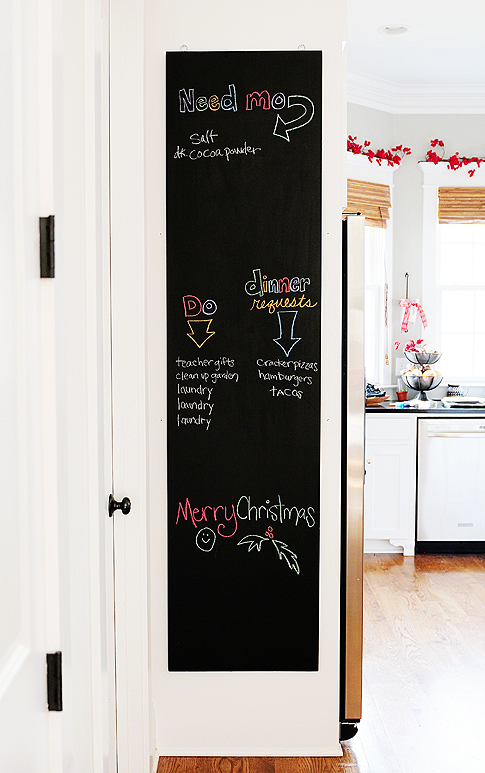 This wooden chalkboard helps keep the lady of the house organized. You can have your to do list, grocery list an menu ideas all in one spot! 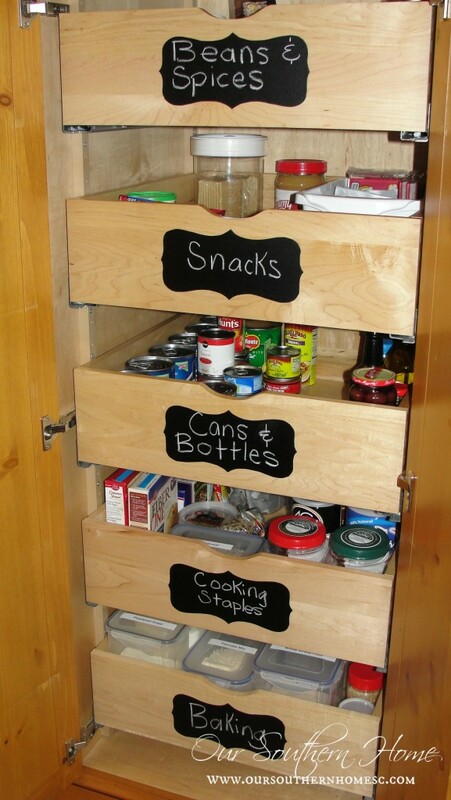 And if you don't have any space to add a chalkboard you can use the inside of another cabinet door! 7.) And I didn't forget about your cleaning arsenal. Gain instant space by using a tension rod to hang all of your spray cleaners on! Genius! 8.) DIY Drawer Dividers: By using hobby boards, I was able to custom make my own wooden drawer dividers and keep my utensils from becoming one huge mess! 9.) Upcycled Spaghetti Sauce Jars: I'm starting a new foundation. it's called Save the Jars! I use mine to store all my dry goods! And even made some chalk labels for them! 10.) Kitchen Cabinets Organization: One of my favorite ways to double up on cabinet space is to use these dollar store stackable bins! What is your most useful kitchen organization technique or tip? I would LOVE to hear it- and that's not an under statement!